Silicone non-stick surface make this easy to use and clean. 1 Before first use, wipe down Cookie Shot Mold, Stand and Melting Bowl with a damp, non-abrasive cloth and dry thoroughly. 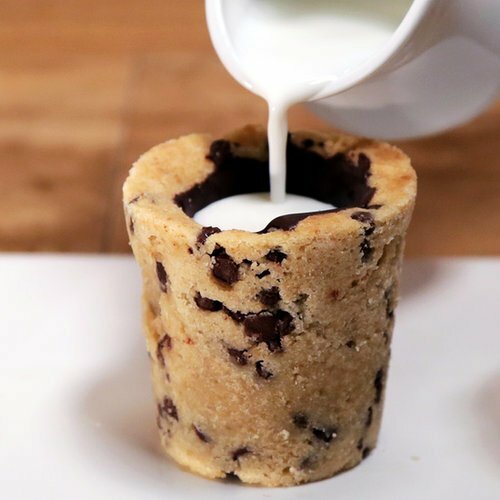 2 Follow the recipe for making the cookie dough and fill it in the Cookie Shot Mold. 3 Put the Cookie Shot Mold in the oven for 30 minutes at 350° F.
4 Let the Cookie Shot Mold cool down completely before attempting to take the cookie shots out of the Cookie Shot Mold. 5 Fit Melting Bowl on top of the Stand and add chocolate. 6 Put the Melting Bowl with chocolate in the microwave for 45 sec or until chocolate melts. 7 Take the Melting Bowl out of microwave and stir. 8 Carefully take the cookie shots out of the Cookie Shot Mold and coat the inside of the cookie shots with a layer of melted chocolate. 9 Let the chocolate cool until hardened. 10 Add milk to the cookie shots and enjoy.